I’ve come to accept that time is a Western construct that has no value in India. When asking what time will something, anything, be happening no real timescale is given. If something is said to be happening at 10:00, it is usually accompanied with a knowing shrug of the shoulders. You know, anytime after 10:00. Not just say maybe around 11:00 but quite literally any time after 10:00. It depends on who knows what, other people, maybe. I don’t know if this is because it is the first mixed-race wedding to happen in the village. It would make sense, a bride who doesn’t speak the language or know the customs, things could just over run or not be ready in time. I expect it’s been difficult to convey exactly what needs to be done where, when or how. The traditional build up that we’ve been a part of has been mostly around meal times. 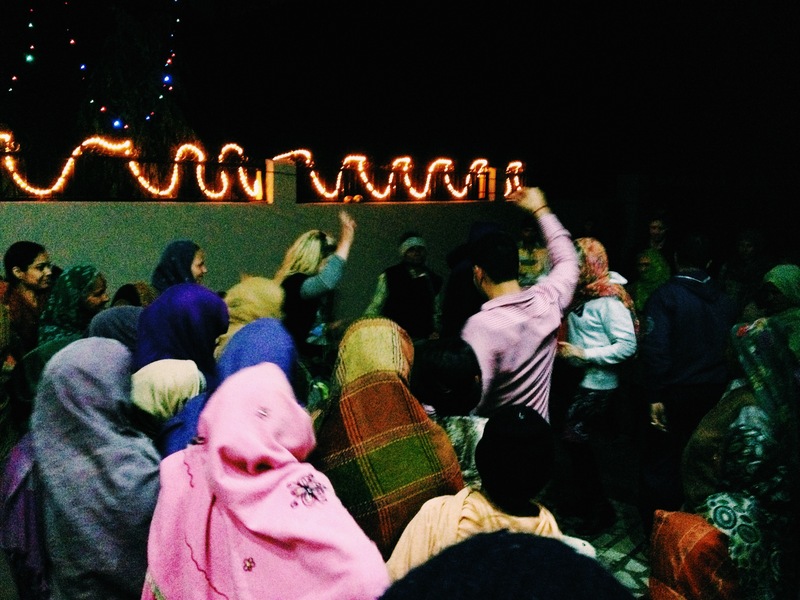 We’ve eaten dinner at a couple of different homes in the village, one at Jagdeep’s uncle’s house, and his best friend’s. Just like breakfast, curries, breads, sweets are all constantly coming out to the table to keep us in good supply while we eat. Then, as it becomes apparent that no more is required, everything is cleared away. The locals begin to move outside. There’s one man, so far it’s always been the same one, who owns a drum. According to Elena he’s also the proud owner of up to three different rhythms. Once he starts playing, there’s no telling when he might stop. The man loves his drum. People begin to dance to his beat. Slowly the pressure mounts on us to get involved. I’m no sober dancer, or a dancer at all, but eventually for a few rounds I managed to get my limbs flailing around as the drummer played on. On the first go, this was pretty fun. The second time around, only a few of us went out for the dancing. A huge crowd of villagers was already building in the courtyard. The only people who danced were us. I say us, Gary and I managed to conveniently find ourselves stuck behind the crowd. The villagers watched on as the girls and Jackson danced on until someone decided that was enough and we could leave. I think this was the first time that I’d felt like we were a prize attraction at the wedding. It wouldn’t be the last. The way back was interesting. Tamsin and Jagdeep were taken aside where they had to place a tray filled with small candles on their head before beginning the walk back to Jagdeep’s house. The drummer followed, the ladies singing. Once returned something happened with the trays, the drummer still continued to play and the dancing started up again, going on long into the night. One of our regular morning visitors was the home-owner. Now I don’t know if he was actually Jagdeep’s uncle or just a family friend. When I used to work with the Indian Government, I always used to think the younger men were calling me brother in the same way that you would refer to me as mate. My understanding of Indian relationships now is that every male older than you is an uncle, the rest are all brothers. Everyone is either a brother or an uncle, which is probably handy when you forget somebody’s name. Anyway, this particular uncle gave us some idea of the importance of the number seven in Hindu weddings with what I guess might be considered a Hindu proverb. Seven colours make a rainbow. Seven days make a week. Seven letters make a friend. Seven turns around a fire make a marriage. We all scratched our heads over this one for a long while. There’s definitely only six letters in friend, isn’t there. F R I E N D. Six. Wait, wait, wait. What if he said friends. That has seven. What if you’re meant to include the ‘a’. It’s all good guys, it’s fine. At least now we all know why seven is a lucky number! 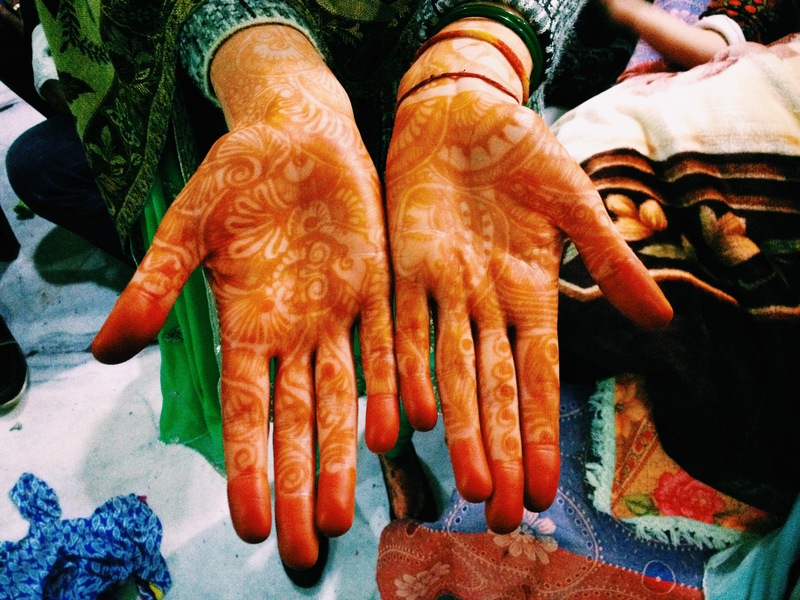 The day before the wedding the henna tattooist arrived to decorate the hands and feet of the ladies. The gent started out in a rich vein of form. Tamsin was first up, out came some sensationally intricate designs. I couldn’t look beyond her hands for a long time, there was just so much going on. It’s hard not to just grab a hold of her hands and trace the lines as they twist, turn across and up her arms. After a few hours and several arms later it became quite apparent that our artist had probably had enough. It became the first of many production lines. In went the girls, with their cards showing the design they wanted and out they came with very basic, very similar swirling patterns. Elena asked Jagdeep for the Hindi word for elephant so that she could get some elephants incorporated into her design. 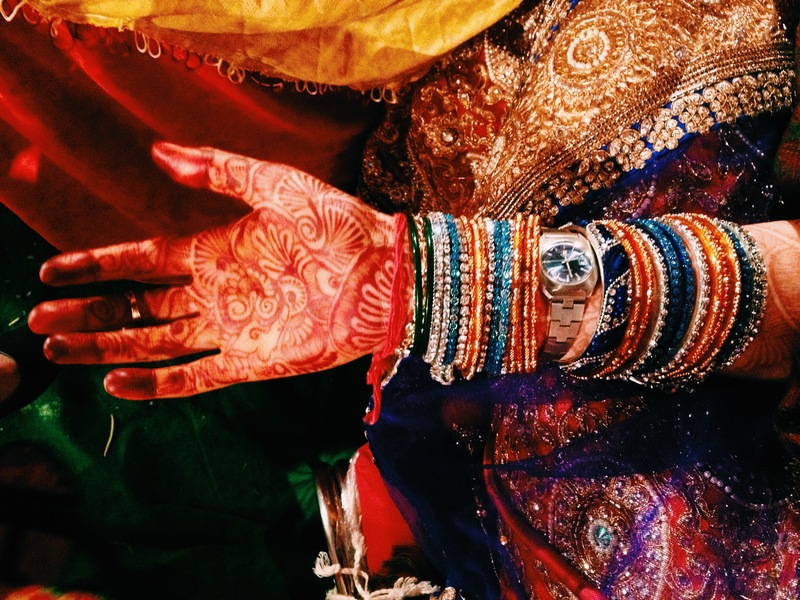 When she asked the good man, he found it rather hilarious, so we’re not sure if Jagdeep had given us the wrong word or if he’d already decided what he was going to do and thought it funny that somebody had the nerve to ask for something else. 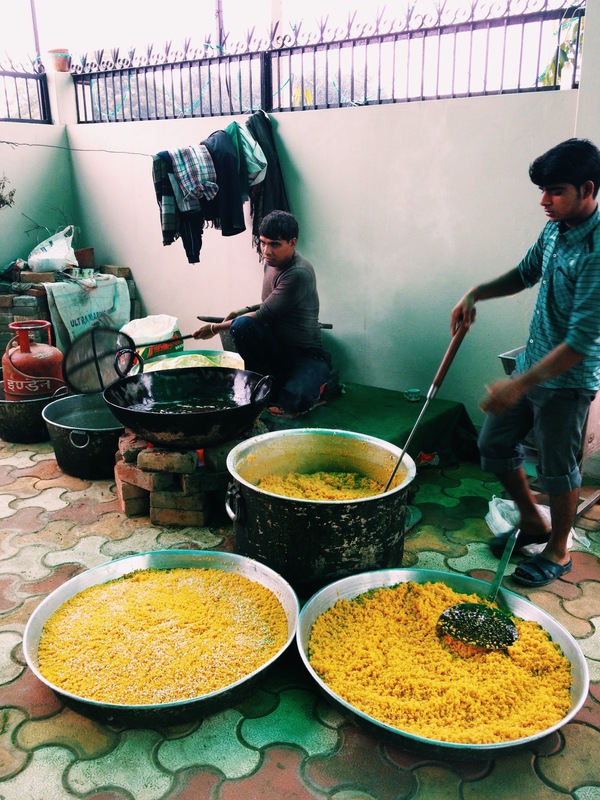 For a few days there had been people milling about in the courtyards of Jagdeep’s house preparing food for the wedding feast. Red carrots were peeled, chopped, shaped and fried. Peas were being shelled. Battered who knows what were being friend up. All kinds of wondrous things were happening. Scents of cumin, cardamon and other spices were now mingling with the ever-present stench of cow. One of the unquestionable highlights of the wedding came prior to the start of the for-real, actually about to get married ceremony. For the majority of the afternoon, or morning, or whatever time it was, the girls had been keeping themselves shut away in the room on the rooftop of Jagdeep’s house. This was getting very real. Dresses were being put on before they were put on another conveyor belt to have their make up done. From what I’ve heard it was almost as if Tamsin was like a cow being fattened up for market. She’d already had her hands and feet painted, she was decked out in some fine fabrics, then her face was painted up before she was finally loaded up with an excess of jewellery. I don’t know the actual order of events. She’d been in the room for most of the day so far. It wasn’t until close to the end of the preparations that I decided I wanted to have a look at what was happening. For what has supposed to have been a coming together of two cultures, it’s been a rather one sided affair. Before we’d left Melbourne for India, Elena’s mum Faye had given Tamsin a watch. It was a watch that had at some stage belonged to either her mother, or her mother’s mother before her. Something of a family heirloom, something old. Something most definitely borrowed. With a blue face, and in need of a new battery all bases were covered. Elena told me that when she went to attach it to Tamsin’s wrist amongst all the bangles things started to get a little heated. In the face of everything that Tamsin had accepted to embrace Hindu traditions, to have the one Christian element rejected sparked a little bit of trouble. Jagdeep had to intervene to make sure that this one small thing would be allowed. Throughout the day as guests came and went, the women all tried to squeeze themselves into the room to see the bride. I get that. There’s this exotic, white woman in your village, about to marry a man who you’ve probably watched grow up and leave. They’ve probably never seen Tamsin until today. That said, she’s about to get bloody married to the man. She’s going to be in full view to everyone at the ceremony. How about a little breathing room here ladies? There were several door guards in position across the day. The job was assigned to me as soon as I walked in. I maintain that I was the most efficient. I had no idea who anybody was so I stuck to my black-and-white rule book. Nobody else comes in this room. I didn’t last very long in the role. There weren’t enough grey areas in my reign as gatekeeper, some people were supposed to be allowed in. Tamsin had been sat huddled under a blanket in the corner so I hadn’t yet seen her fully decked out as the bride-to-be. Maybe you’ve seen the photo that’s done the rounds on Facebook but my goodness, when she stood up and stepped into the light of day she looked absolutely spectacular. You almost felt like you couldn’t blame all of those women for trying to get a sneak peak. Then it came. The moment we’d all been waiting for. It was time to go. Fascinating stuff, love the watch picture, glad she got to keep a bit of her heritage with her during this important day! The bride looks beautiful! Thanks Marena! I hope you guys are enjoying your travels.